KNOXVILLE, TN, April 19, 2012 — Waves Audio, the industry-leading developer of professional audio digital signal processing technologies and the recipient of a Technical GRAMMY® Award, joins forces with Musicsoft Arts to introduce Mashup, the first DJ app to bring Waves studio-quality processing to the iPad®. Featuring an advanced playback engine and effects controlled by an intuitive interface, Mashup lets users play and mix directly from their iPad music library – plus download exclusive tracks from leading DJs like Junior Sanchez and Kris Menace. 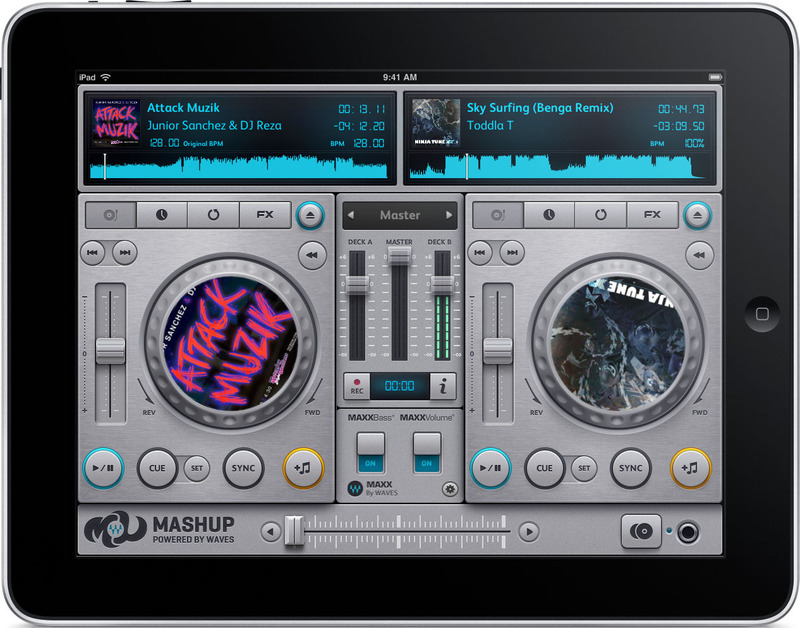 With full support for iPad 2 and up, Mashup is a complete mobile DJ booth, replacing complex, expensive and cumbersome DJ gear like turntables, CDJs, mixers and PCs. Mashup features studio-quality EQ and analog-style resonant filters, Vinyl Touch glitch-free scratching, and independent time-stretch and pitch-shift for each of its two stereo decks, effectively saving users thousands of dollars in gear. 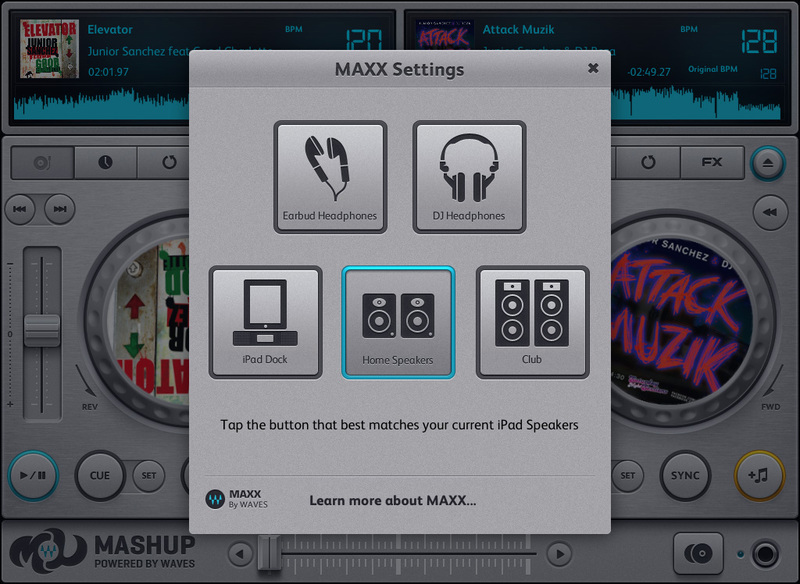 Users can also take Mashup’s performance to the next level using Waves MaxxAudio enhancement, available at an additional charge. MaxxAudio for Mashup includes MaxxVolume all-in-one dynamics control, which dramatically increases the output levels of headphones and external speakers; MaxxBass psycho-acoustic bass enhancement, which delivers deep, rich lows listeners can really feel; and preset sound modes for earbuds, headphones, docking stations, home stereos and club systems. The Mashup app from Waves Audio and Musicsoft Arts is now available from the App store for an introductory U.S. MSRP of $39.99. For more information, please visit www.waves.com. Musicsoft Arts is a New York City-based company that is fully dedicated to building great mobile music Apps. In the last 2 years, Musicsoft Arts has established itself as a leader in the rapidly growing mobile music Apps market with multiple music Apps in the top music iTunes App Store charts, and over 10 million App installs by worldwide music fans. http://musicsoftarts.com. Waves offers software and hardware solutions for the professional and broadcast markets. Additionally, Waves also offers semiconductor-with-embedded-software solutions under the Maxx brand for consumer electronics audio applications. Waves’ Maxx technologies dramatically enhance audio performance and are used by industry leaders such as Dell, Sony, Sanyo, JVC, Toshiba, and many others. All other product names and trademarks are the property of their respective owners, which are in no way associated or affiliated with Waves.